All-on-four is a term used to describe the use of 4 dental implants to replace all of the teeth in an arch with a fixed bridge. This popular treatment is commonly provided for people who have lost all of their teeth months or years in the past and no longer wish to have removable dentures. Teeth-in-a-day refers to the provision of the All-on-four treatment for people who still have their own teeth, but whose teeth are failing. 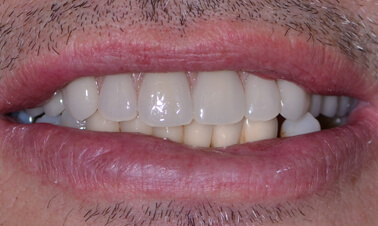 This revolutionary technique enables a whole arch of failing teeth to be replaced with dental implants and fixed teeth in a single visit. 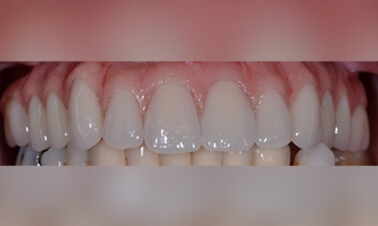 The teeth are removed, implants placed and high-quality fixed temporary teeth are fitted, all without the patient needing to leave the Clinic. 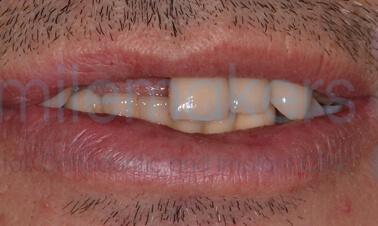 Once the healing period is completed and the implants have integrated with the bone, a high-quality, durable permanent fixed bridge is fitted. What are the benefits of All-on-four/Teeth-in-a-day? Can completely replace a failing set of teeth, without the need to wear dentures. 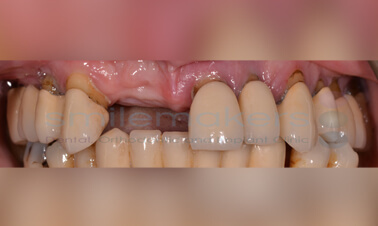 Replace the need to have removable upper and/or lower dentures. Improve your self-confidence by not worrying about your dentures moving whilst talking or eating. Potentially reduce the need for future bone augmentation for dental implants. How many implants will I need and how long does treatment take? Placing a 10 to 12 tooth fixed-bridge requires the placement of 4 to 6 dental implants at strategic positions and angles in the jaw. Following placement of the implants, a healing period of 3 to 6 months is left to allow the implants to integrate strongly into the bone. For those patients having Teeth-in-a-day, a provisional bridge will be fitted during this period. This bridge is fixed to the implants but is only designed to last up to 18 months. Once the integration period is over, the final bridge is constructed over the course of a few visits, meaning that the complete treatment usually takes around 9 months from start to finish. These treatments are truly some of the most life-changing treatments available in modern healthcare. Please contact us to discuss how these treatments could help you.